The Hyundai Intrado concept has a lot going for it. Giant bubble-top styling, orange leather interior, and it could end up being Hyundai's first bespoke hydrogen production car. Hyundai is currently setting up a lease program for a few dozen hydrogen-powered Tucsons called the ix35 in southern California. That's the only place in the country with a reasonable number of hydrogen fueling stations (there are between 5 and 10 so far). The hydrogen Tucsons look exactly like their internal-combustion-powered equivalents, and appear to be little more than a pilot program to see how the SoCal market responds to hydrogen cars. 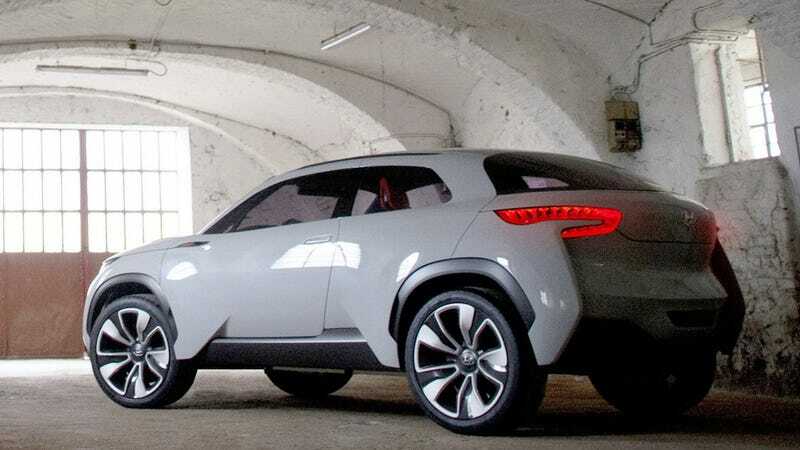 But the three-door Intrado concept gets that hydrogen drivetrain, but with an all-new body. These pictures popped up on CarScoops and I gotta say that the crossover looks pretty sweet. I think it's down to big bubble top and the wavy wonky rear. The orange leather is weird, but the minimal console is what's best. Hopefully this has Hyundais' great Kinect-style no-touch infotainment system. When Hyundai goes ahead and starts making hydrogen cars in earnest, I wouldn't be surprised if their first all-new car looks a lot like this.